Rensselaer Polytechnic Institute's program manager Mike Gunther answers some common questions surrounding summer programs and gives a glimpse at what makes these technology-savvy camps so special. How can I find the right summer camp or program for me? Summer programs on a college campus give you an opportunity to get the look and feel of what college life will be like one day! Many colleges offer credit and non credit programs. Our campus in northeastern upstate New York offers non credit residential enrichment programs (Summer Camps) for high school students during the summer. Many parents and students will go online and search for summer camps or talk with their high school guidance office. Schools have contacted me to come host an information session, participate in an education fair, camp fair, science or engineering fair, or community event. If you are looking to have Rensselaer Polytechnic Institute visit your school or event, contact me at 518-276-8351 or visit our summer website and complete an outreach request form. What happens during academic/college preview summer camps? At Rensselaer, each summer enrichment program (Summer Camp) has been proposed by a Rensselaer faculty member. The faculty are involved in the hands-on teaching of the program and will include other faculty experts, undergraduate, and graduate students to assist with the program. Below is post-program feedback from our Engineering Summer Exploration Program this past summer. Student Feedback: "First of all, thank you for a wonderful week at the Engineering Summer Exploration Program. I learned tons of useful information and really got a deeper sense for many of the different engineering disciplines we looked at. Most importantly, I left with an appreciation for the importance of engineering in today's world. The program was extremely well run, and I really appreciated the opportunity to meet RPI grad students and professors. As a 10th grader, it was really cool to get to work in such a well-equipped, high-tech lab. Thank you once again." Faculty Reply: "Thank you for your kind words. I am very glad that you had such a positive experience. It is a testimony to the many dedicated faculty members we have at Rensselaer who put a high value on delivering quality education and experience to our students. Though, like many things in life, one tends to only get out of an education what one is willing to put into it. As such I am confident that a principal reason you got a good deal from your experience at Rensselaer is because you put a good deal of effort into it yourself. We wish you much success in the coming years, and hopefully we will see you back at Rensselaer." What types of summer camps and programs are there at Rensselaer? At Rensselaer, summer enrichment programs (Summer Camps) allow elementary, middle, and high school students the chance to participate in non-credit programs that stimulate their minds and exercise their bodies. We offer residential enrichment programs for high school students in aerospace engineering, architecture, chemistry and medicine, computer game development, engineering exploration, and business. We continue to add more programs each summer! Parents and students are encouraged to visit the program listing online for additional information such as full program descriptions, application/registration forms, and costs. What’s the pre-college summer program application process like? Rensselaer’s summer enrichment programs (Summer Camps) registration/applications open by January 1 each year. The process is not that difficult. Some applications will ask for details on the program specific courses they have taken and SAT or PSAT scores. Successful applicants have provided details on their accomplishments. The application is your opportunity to let the faculty program director know who you are and why you want to be on campus in the summer. Currently no financial aid is available for our non-credit summer enrichment programs (Summer Camps). In addition, our college is committed to providing opportunities for underrepresented and economically disadvantaged students in grades K-12 that will improve their access to and their ongoing success in the science, technology, engineering, and mathematics (STEM) fields. Many of our programs are individually priced, and parents and students can visit our website for details. How can I make the most of attending a summer program? As you plan your visit, check out schools’ admissions events webpage for special visiting days. At Rensselaer, we have designed an extended visit schedule with morning and afternoon schedule options. In addition to the information session and campus tour, you'll have the opportunity to attend academic sessions and have lunch with current Rensselaer students. If you would like to learn more about a summer enrichment program (Summer Camp), ask the admissions office to see if they can schedule time for you to meet the department/faculty responsible. 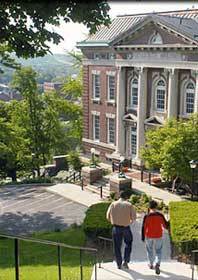 Contact Rensselaer’s admission office to learn more about visiting campus.